Oklahoma offers many culinary treats, but a delicious meal at a good soul food restaurant is always worth traveling a few miles off the beaten path. Evelyn's Soul Food in Tulsa features delicious fried chicken alongside famous sides like collard greens, sweet yams and macaroni and cheese. Soul food, a popular term coined in the 1960s to describe the African American cuisine prevalent in the southern United States, is nothing short of hearty, comforting and delicious. Passed down through generations of African American families, soul food recipes form the cornerstone of today’s Southern comfort food revival. Dishes made from staples such as okra, corn and greens, as well as generous portions of crispy fried chicken and tender barbecued pork, have been sticking to the ribs of Oklahomans for decades. Come along as we explore some of Oklahoma’s best soul food standouts. When Wanda J. was a young girl, she watched intently as her mother Evelyn cooked delicious meals that filled you up and satisfied the soul. It wasn’t long before Wanda J. went from making mud pies in a hollowed out Chevy to serving up soulful classics at a restaurant dedicated to the woman who inspired her. Evelyn’s Soul Food in Tulsa is the result of a lifetime committed to providing simple, delicious food in a warm, friendly atmosphere. The classics are well represented on the daily menu of fried catfish, pork chops, chopped sirloin, candied yams, buttered corn, macaroni and cheese, and greens. Keep an eye out for the delicious daily specials: beef tips and rice, meatloaf, and fried chicken, which is perfectly seasoned and fried to golden perfection. Wanda J. is still committed to giving her customers a soul-satisfying meal and opened a second location, Wanda J's Next Generation, which provides the same blend of excellent service, homestyle food and friendly atmosphere regulars have come to expect. Old-fashioned Southern comfort cooking sets Sweet Lisa's Cafe apart. This Tulsa eatery specializes in fried pork chops and fried catfish, best enjoyed with a side of mashed potatoes, black eyed peas, okra or cabbage. Come in for the chicken fry, and add a side of cornbread for a truly Southern meal. At Sweet Lisa's Cafe, choose between tilapia, wings, chicken and burgers while also leaving room for dessert. From pecan pie and red velvet cake to cream pie and cheesecake, indulge in sweet comfort food at Sweet Lisa's Cafe. Featured on Food Network’s popular series Diners, Drive-ins and Dives, Mama E’s in Oklahoma City is a true soul food experience. Menu items include chicken and waffles, burgers, catfish, fried ribs and pork chop sandwiches. Bring your appetite and order the Soul Food Daily Special, which pairs two meats, three sides, a slice of cornbread, a dessert and a drink. You might even consider taking a friend and sharing the plate. The meat at Mama E’s is perfectly seasoned and slow-cooked for hours. With soul food, the sides are just as important as the meat, and Mama E’s has the classics covered with delicious helpings of stroganoff, baked macaroni and cheese and fried okra. It wasn’t long before Wanda J. went from making mud pies in a hollowed out Chevy to serving up soulful classics at a restaurant dedicated to the woman who inspired her. Established in 1952, Florence’s Restaurant in Oklahoma City has been serving mouthwatering soul food for over 60 years. Florence’s traditional breakfast offerings include steak, ham and pork chops served with home fries or rice. When lunchtime rolls around, Florence’s breaks out the soul food classics like smothered chicken, farm-raised catfish and their famous fried chicken dipped in sweet potato glaze. With mashed potatoes, seasoned spinach and country cabbage on the side, and daily specials like chicken and dumplings, honey meatloaf and pot roast on rotation, you have yourself a traditional and hunger-demolishing soul food experience. Massey’s Barbecue in Okmulgee is all about the meat: chopped pork, hot links, smoked chicken, sliced beef, chopped beef, ham, turkey, ribs and more have customers returning time and again. Try the appropriately named “Massive Sandwich” for bread piled high with beef, a rib, smoked bologna and a hot link. 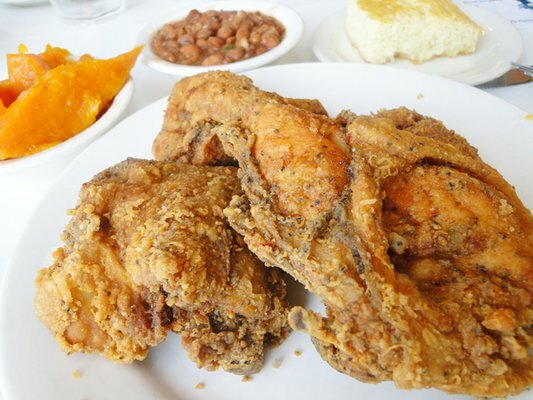 Diners can also feast on orders of fried catfish, fried okra, coleslaw, corn nuggets and baked beans – just don’t forget to top it all off with a sweet serving of peach or blackberry cobbler. They didn't waste any time on creating a fancy ambiance; it’s all about the food at Massey’s. And it works. For a satisfying, soulful, Southern-style meal, Aja Bleu Café in Oklahoma City is always a good choice. Like all the restaurants on this list, Aja Bleu delivers on the soul food goods. Menu items include fried catfish, chicken strips, lemonade, pork chops and the ever-popular wings and waffles. They also offer diner classics like burgers and fries, so there is always something for everyone. Aja Bleu is only open until five, so arrive early for some soulful delicacies at this stand-out café. A legendary destination for late-night carousers around downtown Oklahoma City, Bobo’s Chicken serves up some of the best fried chicken in the city, but it takes a little effort to get to them. Only open Friday and Saturday evenings until well after midnight, Bobo’s has a simple menu that never fails to satisfy. First and foremost is the fried chicken (bone-in wings exclusively), which is smoked before it’s fried, lending it a unique, mouthwatering flavor. Paired with fries and biscuits, the meals are served with honey drizzle or without (most patrons insist that it would be a senseless denial of pleasure to refuse it). Bobo’s also offers fried shrimp and catfish, all served with the same simplicity and skill. So, next time you’re out late and need some soulful nourishment, look for their signature red trailer and get in line for some of the best chicken around. Off the Hook Seafood & More got its start as a humble local food truck, garnering a wide audience impressed by its array of spicy flavors and southern comfort seafood. In 2015, Off the Hook Seafood & More opened its first official brick & mortar with seafood specialties like smothered seafood fries covered in lobster cream sauce, bacon, cheese, fried onions and chives. Other fan favorites include blackened chicken, crispy Cajun crawfish and soft shell crab po'boys. Sides like Kool-Aid pickles, cheesy grits, grilled asparagus, collard greens and fried okra round out main dishes at this Oklahoma City restaurant on Britton. The popular seafood joint added a second Off the Hook Seafood & More location with a mixture of popular dishes and location-specific cuisine. At the Meridian location, customers can munch on chicken and pancakes topped with a creole compound butter, smoked salmon burgers, melted lobster sandwiches and lemon pepper wings. Stop by both locations for a taste of Southern homestyle seafood served fresh. Known for its award-winning catfish, C'est Si Bon Cajun Catfish & Po-boys offers a variety of Southern food favorites at its Midwest City and Del City locations. Flavorful seasonings shine through in housemade sauces and seasoning blends like the tiger sauce, the perfect complement to a one pound catfish order. At either location, guests can choose between delicious entrees like crawfish etouffee, seafood avocado salad, stuffed shrimp and blackened chicken pasta. Each main dish comes complete with savory sides like potato au gratin, candied yams, cornbread and red beans & rice. Whether indulging in a cochon de lait pig po-boy, boudin balls, jambalaya or gumbo, be sure to sweeten the meal with the well-loved C'est Si Bon bread pudding.